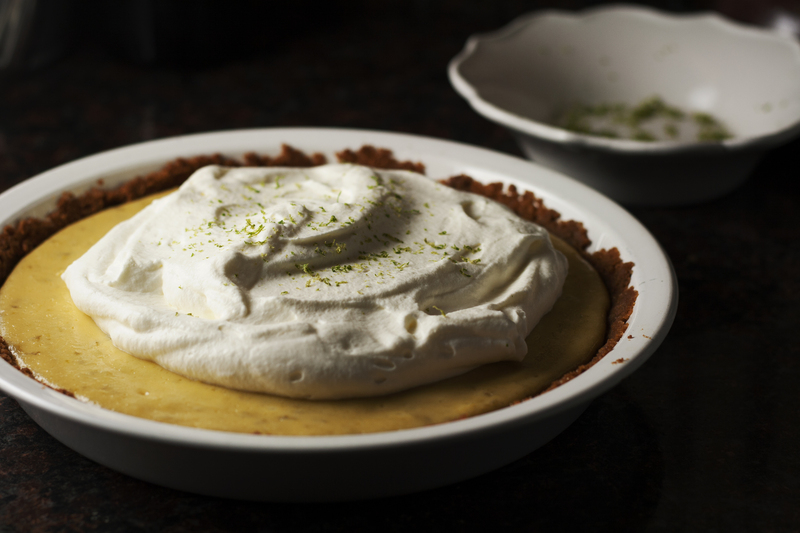 Sweet and bright, key lime is probably one of the simplest of all the pies. The filling is all of three ingredients, and it’s in and out of the oven in a snap. Once cooled a bit, it’s chilled in the fridge, and that, perhaps, is the hardest part: the agony of waiting to cut a slice as you anticipate that tang on your tongue, dreaming of summer all that time. But that wait? Totally worth it. Here’s to you and yours and another glorious celebration of the ratio of the circumference of a circle to its diameter. Happy Pi Day indeed. 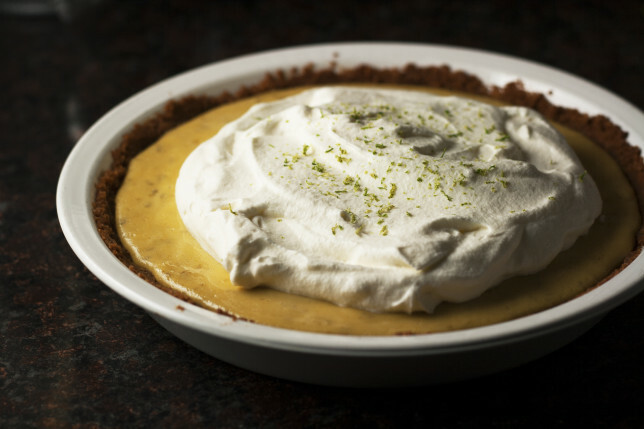 If you’ve ever been afraid to make key lime pie because you think you need to go on a search for those mysterious key limes, I’m here to strip away your fear: go to your supermarket and buy those 5-for-$1 Persian limes — and maybe a couple of extras for a gin and tonic. Then mosey over to your baking section and get a can of sweetened condensed milk — but not the light kind. And finally, yes, you’ll want an entire box of graham crackers because, duh, summer is coming and you’ve gotta start getting your s’mores game on. In a medium bowl, whisk egg yolks and lime zest with an electric mixer until lightened in color with a green tint, about 2 minutes. 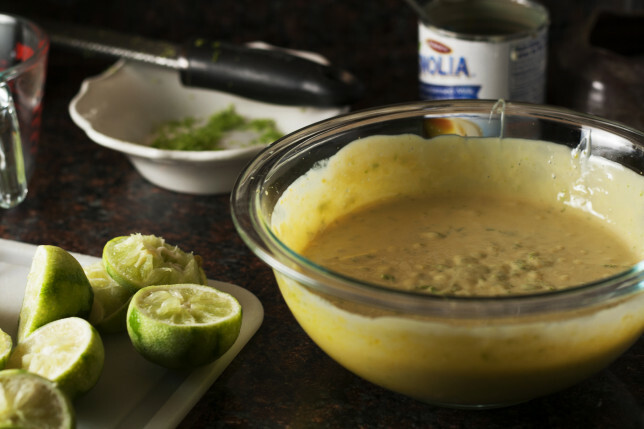 Whisk in condensed milk until smooth, and then whisk in lime juice. Cover with plastic wrap and let sit at room temperature until thickened, about 30 minutes. Preheat oven to 325 degrees. Grind graham crackers in a food processor to fine and even crumbs, about 30 seconds. Pour in melted butter, sugar, and salt and pulse to incorporate, about 5 pulses. Dump the mixture into a 9-inch pie plate and, using the bottom of a measuring cup, press evenly across the bottom and up the sides. Bake until the crust is fragrant and beginning to brown a bit, about 13-18 minutes. Transfer to a wire rack, and keep the oven on. While the crust is still warm, pour in the filling. Bake until the center of the pie is firm but still jiggles slightly when shaken, about 15 to 20 minutes. Let pie cool slightly on a wire rack, about 1 hour, then cover loosely with plastic wrap and refrigerate until fully chilled, about 3 hours. When the pie is chilled, make your topping by beating together cream and sugar until soft peaks form. Spread decoratively over the pie. Sprinkle with any remaining lime zest if desired. 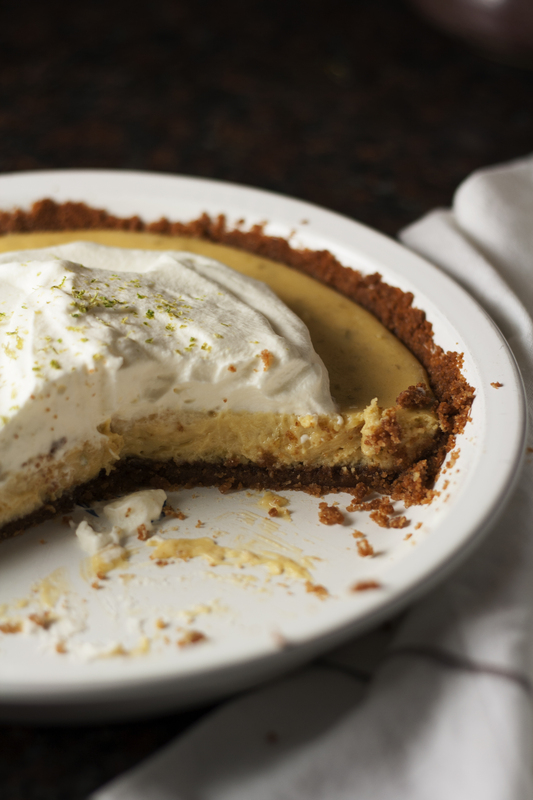 Key lime pie keeps in the fridge for about a week.